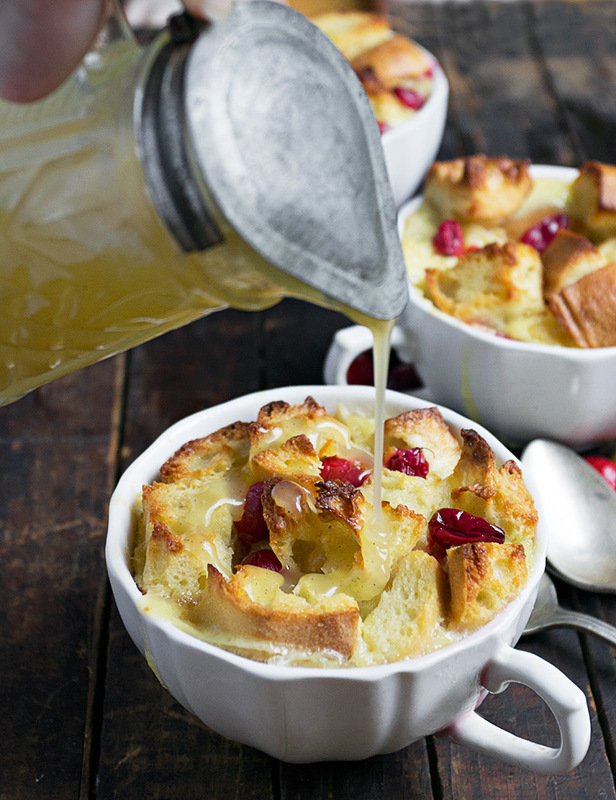 Comforting and creamy Cranberry Orange Bread Pudding, flavoured with fresh cranberries and orange marmalade and topped with a warm Butter Sauce. As subscribers to my Newsletter already know, I’m celebrating cranberries this week, starting with this Cranberry Orange Bread Pudding! Cranberries are near and dear to my heart, not only because I love them, but because I live in cranberry country. 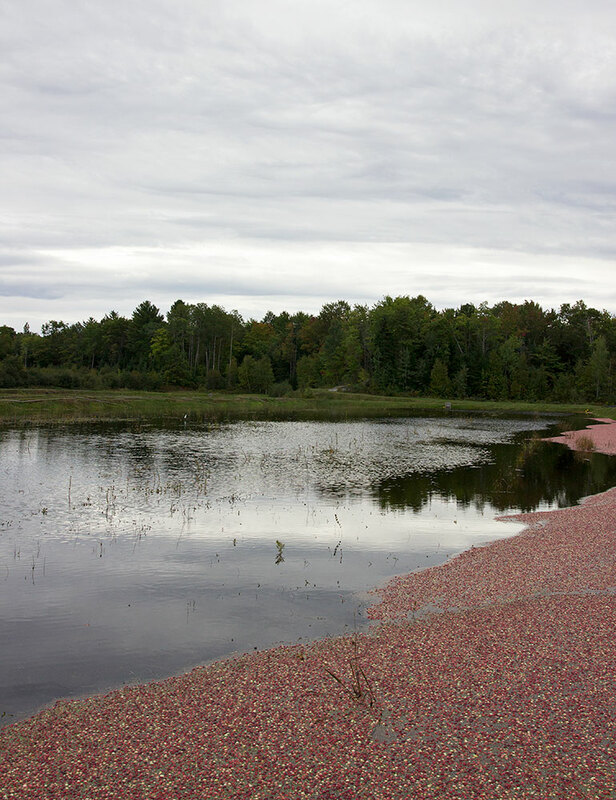 Cranberries grow natively here and there is also a large commercial Cranberry Marsh nearby, so I have ready access to the freshest of cranberries every Fall. I paid a visit to the Cranberry Marsh a few weeks ago, just as the Fall harvest was beginning. For those that aren’t aware, cranberries grow on very low shrub-like bushes. They aren’t “picked” in the classical sense though. 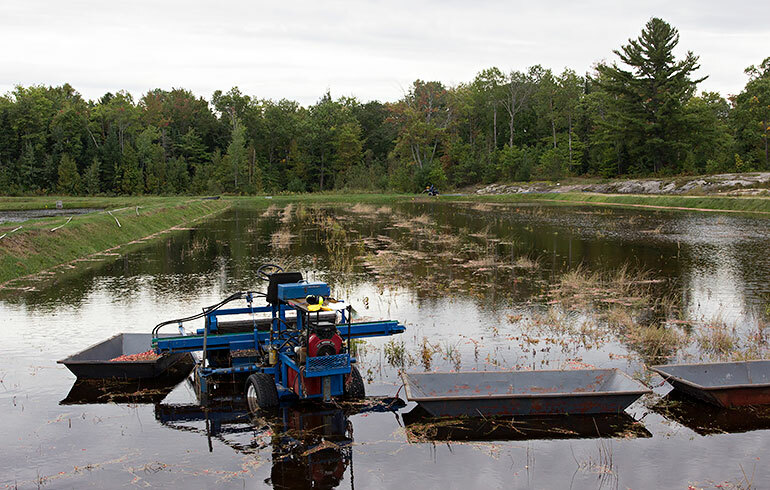 To harvest cranberries, the field is flooded and the berries are loosened from their bushes by agitating the water with a tractor fitted with a rotating rake. 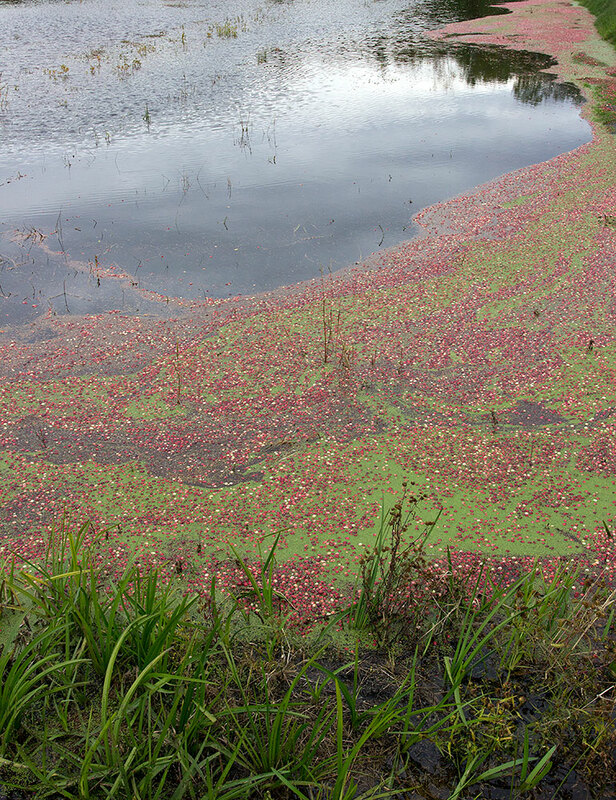 Once loosened, the cranberries float to the top and are skimmed off. It’s a unique process and great fun to witness. Did you know? 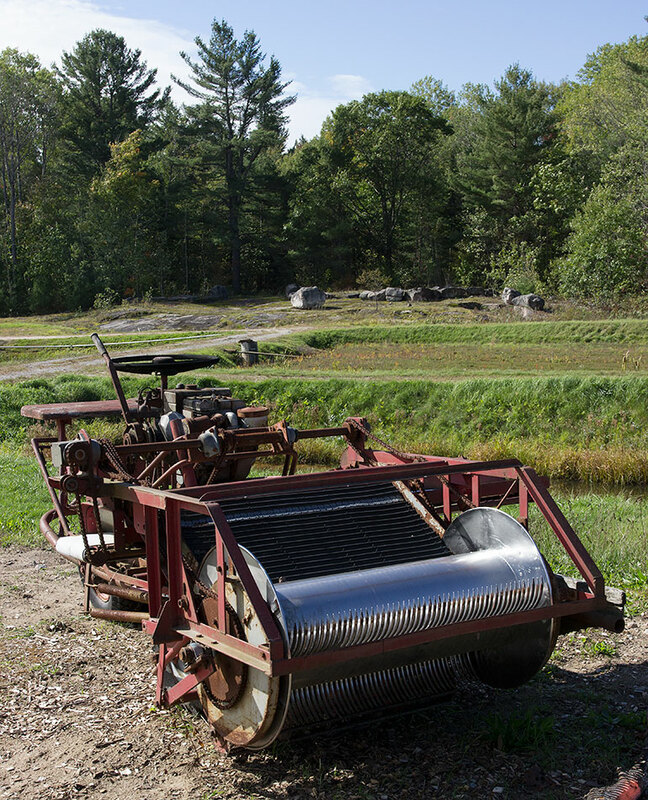 The cranberry harvester doesn’t float on top of the flooded fields (I always thought that!) It has tires and it actually drives on the ground. Although the field is flooded, it doesn’t need to be deep as the cranberry bushes are so low to the ground. So obviously, I brought back a huge bag of fresh cranberries, which will keep me in cranberries for some time. One of the first things I baked up was this bread pudding. 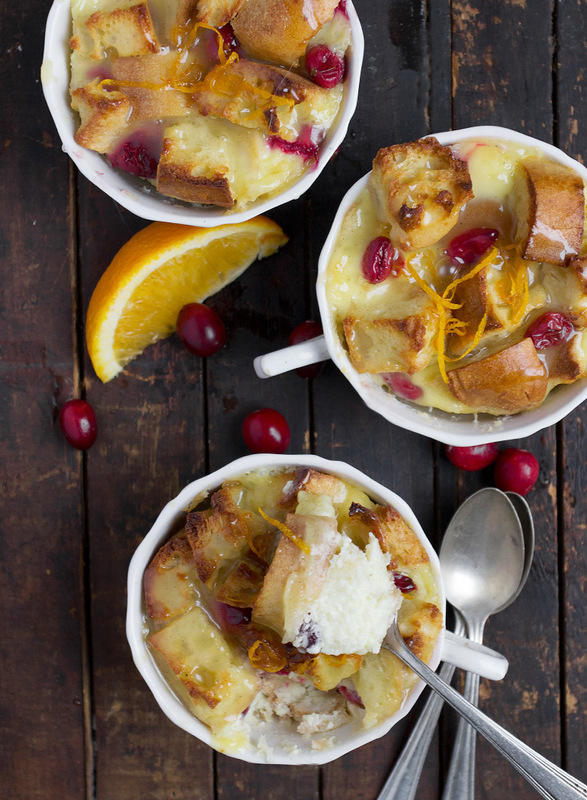 Cranberry and orange are a perfect combination and of course, bread pudding is classic comfort food. This bread pudding is flavoured with orange marmalade. If you don’t have marmalade on hand, simply substitute a bit of orange juice and zest instead. To top my bread pudding, I made an old fashioned Butter Sauce, made simply and quickly in a saucepan by warming together butter, sugar, cream and vanilla. It’s a delicious sweet complement to the tart cranberry and orange flavours. Did you know? Cranberries freeze beautifully. They don’t need any pre-freezer preparation. 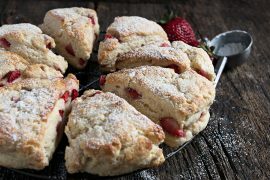 Just pop the cranberries into a freezer bag and enjoy them from the freezer for up to a year! 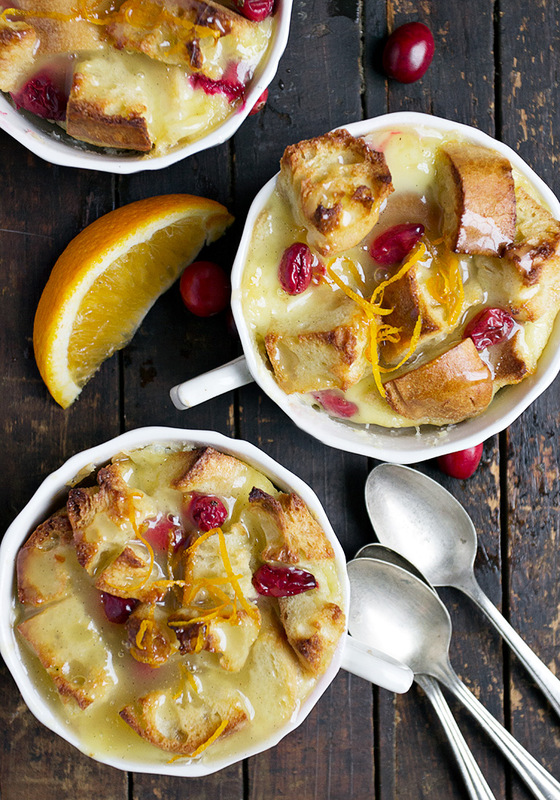 Delicious bread pudding, studded with fresh cranberries and flavoured with orange marmalade. Alternately, you could use a bit of orange juice and zest to flavour the custard. Cut bread in to cubes and place in a large bowl. In a medium bowl, whisk together the half & half, cream, vanilla, eggs and sugar. Pour over cubed bread. Allow to stand at least 30 minutes and up to an hour, stirring a couple times while it stands. Preheat oven to 350F Prepare individual serving dish (or one 8-9-inch-ish large dish) by greasing and placing on a baking sheet (to catch any boil overs). Add cranberries and marmalade to bread/cream mixture and stir well to combine. Using a slotted spoon, spoon bread in to serving dish (or dishes). (*I like to extend the bread above the edge of the dish, as I like the crispy bits at the top in addition to the creamy bottom.) Pour remaining liquid over-top, allowing at least 1/4-1/3 inch at the top of the dish. Bake in pre-heated oven for 50-60 minutes or until a knife inserted comes out clean (*check at the 40 minute mark and cover loosely with aluminum foil if tops are already golden enough). Meanwhile, prepare Butter Sauce by combining all ingredients except the vanilla in a small saucepan. Cook, stirring regularly, over medium heat until mixture comes to a boil, about 5 minutes. Stir in vanilla. Serve warm. Serve with warm Butter Sauce. Hi Jennifer, I didn’t see a size for the baking dish for this recipe? I’m guessing it’s an 8×8 or a 9×9 based on the amounts but thought I may as well ask. 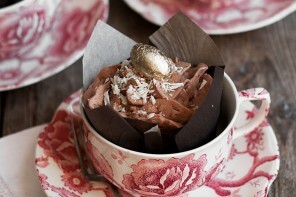 I’m going to be making this for one of my desserts for our Christmas brunch. It sounds divine! Hi Kathy, Yes, and 8 or 9-inch dish should work just fine. Enjoy! Thanks Jennifer. One more question, have you ever let the prepared dish sit overnight, refrigerated, before baking? Hi Kathy, I haven’t refrigerated this one specifically, but I have refrigerated other bread puddings overnight successfully, so I think it would work just fine. I find they are a tiny bit more dense, as the bread is quite saturated, but still very enjoyable texture. I have loved bread puddings since my grandfather would sit me on his lap to mix all the ingredients in a big bowl while he told me stories. He never cooked but he did love his bread puddings so that’s what we’d make together. His was very plain but he would have been wowed by this amazing deliciousness! Holy smokes, Jennifer – those flavours are fantastic and the sauce! Love seeing the pics of the cranberry fields. I’v only seen them in BC. I’ve got to go pay a visit! 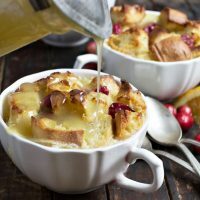 I absolutely adore anything cranberry orange, and this bread pudding looks sublime (especially with that butter sauce!). Yowza, those look fantastic! And that buttery sauce. Swoon. I didn’t know you live in cranberry country! How cool is that?! 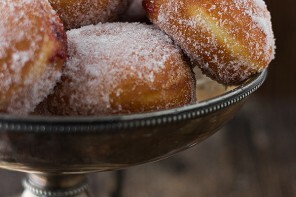 Love those shots and I’d love to go wadding in that cranberry filled water! I’m excited for your cranberry week and this is one heck of a way to start! This bread pudding looks absolutely incredible!!! Plus that butter sauce has me drooling! I need this in my life. ;) Cheers, friend! oh. my. that butter sauce has me swooning. my mom is a marmalade aficionado so i simply have to make this for her. what a perfect compliment to those cranberries! This is absolutely fascinating! Thanks for sharing this field trip – I just love to see how things grow. There are some cranberry drink commercials where they stand in the water surrounded by floating cranberries so I figures they got them in the water somehow – but never knew! Thanks again and especially for the recipe. It looks and sounds fantastic. Would you believe I’ve never made bread pudding, sweet or savory. I better get with it! Thanks Tricia and yes, you must try a bread pudding! It’s a great way to use up stale bread. I always seem to have lots of that, so I freeze it for bread puddings in the winter. Sounds like a fun time at the Cranberry Marsh Jennifer! I’ve actually always wanted to visit one. I guess you can cross that off your bucket list! One of my favorite desserts is bread pudding. I never liked it when I was young, but let’s just say I’m making up for it now! I love the cranberry orange flavor of this one. I think I may substitute some challah for the baguette because that’s my favorite! Thanks for the fun facts! Can’t wait to try this one! This looks amazing, and I love all the cranberry fun facts, had no idea they turned sweet! 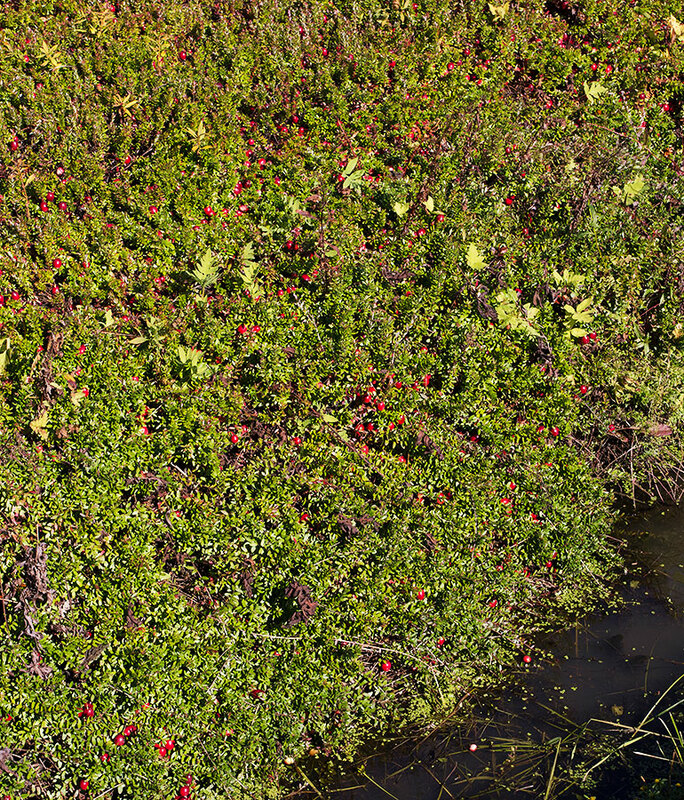 I love seeing pictures of the cranberry bog. I had no idea how they grew. What a beautiful fall sight! This bread pudding looks AMAZING and I’m pinning it as I know it needs to be on our November menu! Thanks so much, Chris and yes, this pudding is perfect for holiday eating! 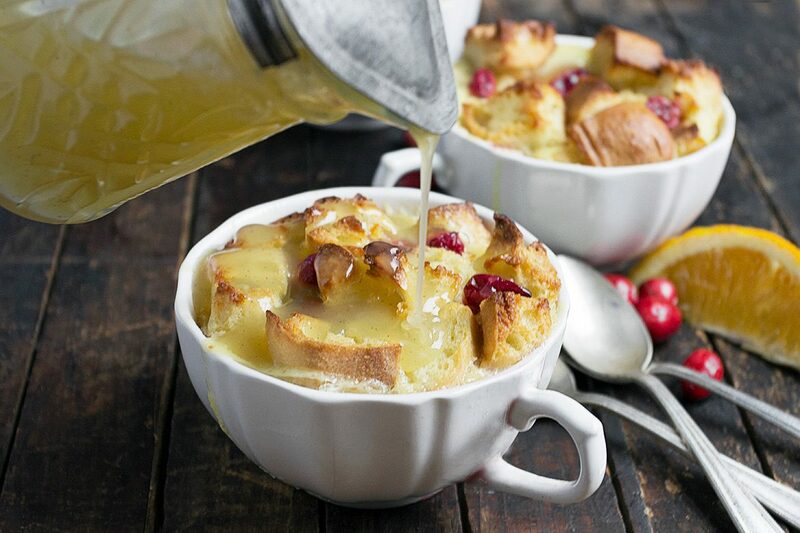 I’m so jealous ~ I would love to find myself among all those luscious cranberries :) Your bread pudding looks amazing, I think I want to pour that sauce over everything! Thanks Sue! It was such a perfect Fall day the day we visited. 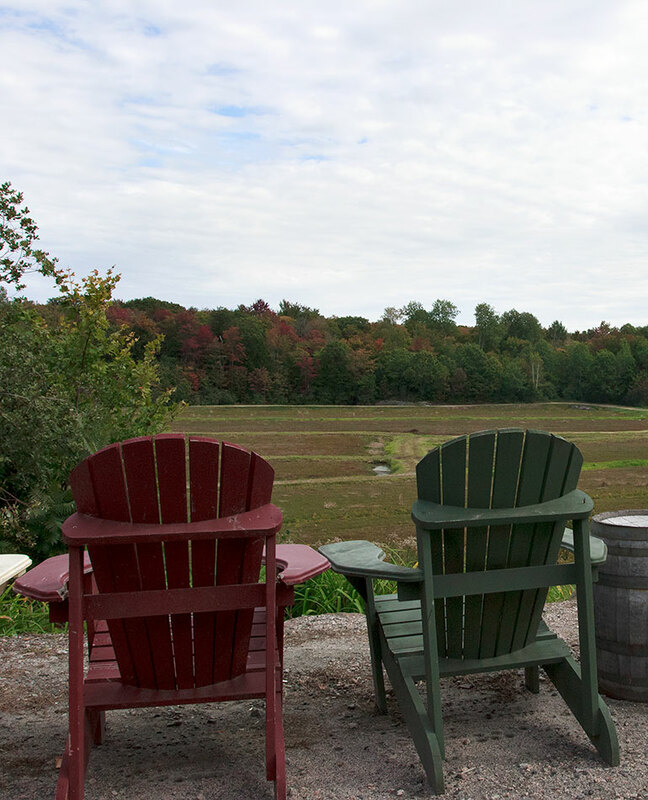 We did the Bog to Bottle tour, ending with a (cranberry) wine tasting :) And thanks. That Butter Sauce is so lovely and a nice change from the usual.